BARCELONA -- BlackBerry phones with their physical keyboards were around years before the iPhone emerged in 2007. Yet, BlackBerry devices today command less than 1% of the world's smartphone market. 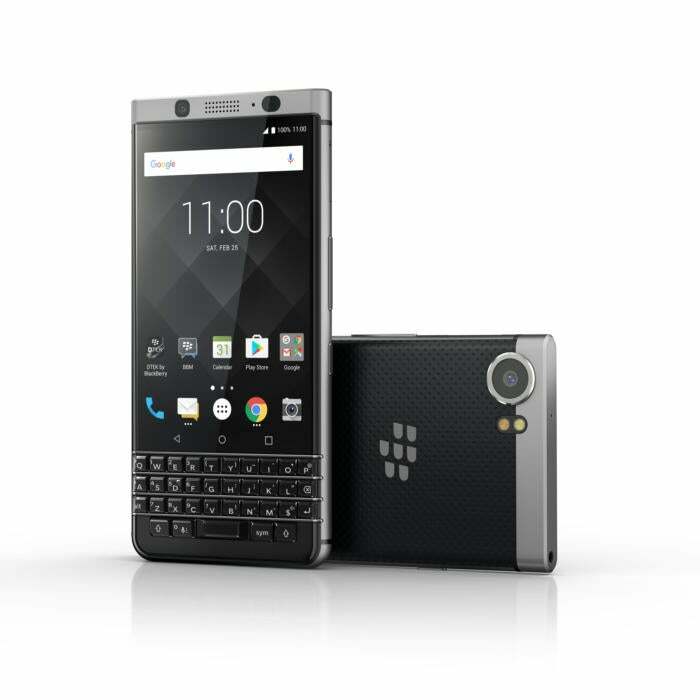 Under a licensing deal with BlackBerry of Canada announced last year, TCL Communication of China on Saturday announced another physical keyboard smartphone model called the BlackBerry KEYone. In a bid to recall the glory days of BlackBerry, the KEYone features a 4.5-in. touchscreen as well as 52 raised physical keys in four rows at the bottom and a speedy SnapDragon 625 processor. The device goes on sale globally in April. In the U.S., the phone will have a price tag of $549. It will be available on major U.S. carriers, but first will be sold online, BlackBerry officials said. TCL Communication CEO Nicolás Zibell announces the Blackberry KEYone smartphone with its physical keyboard in Barcelona. At an event in Barcelona days before the start of the Mobile World Congress trade show, TCL officials called the KEYone the world's most secure Android phone. It will run Android 7.1 but will add on traditional BlackBerry security, including an on-phone security tool called DTEK. Now in its third version, DTEK lets a user quickly check if apps are meeting the security permissions that the user has authorized. If an app is accessing a user's camera to take a photo or turn on the phone's microphone, the user can be alerted. TCL is licensed by BlackBerry to manufacture and distribute the new KEYone, but BlackBerry still has its hands on the phone's security development, said Steve Cistulli, TCL North America president. All the security software related to the KEYone will be compiled by engineers in Canada where it will be signed and certified—an important consideration given the state of foreign affairs and international cybersecurity concerns about the nation of origin for security software, he added. TCL's goal is to beef up BlackBerry's 1% market share in the U.S. to 3% by 2020, and to jack up the current 5% share in Canada to 8% to 10%, Cistulli said. "We'll compete directly with Apple and Samsung," he said, pointing to the top two smartphone makers in the world. TCL will start by taking the KEYone directly to BlackBerry customers, who number about 275 million globally. After that, BlackBerry will market to consumers who are in the bring-your-own-device market, he said. TCL makes televisions sold in the U.S., but is largely unknown there. TCL also makes lower-cost Alcatel smartphones sold in the U.S., but the KEYone will be a higher-priced flagship brand, he said. "We have to go after Samsung," he said. "It's not going to be easy, but it's a viable opportunity." The KEYone has plenty of appealing features, including its fast SnapDragon processor and a 3,505 mAh battery that can be charged to 50% in 36 minutes. Its physical keys can be swiped like a touchpad to move what's on the screen up or down or left to right. There's also a 12-megapixel rear camera and 8-megapixel front camera. Each of the 52 physical keys can also serve as a customizable shortcut. For example, the "F" key when touched can be a quick path to reach Facebook, or the "C" could be customized to open the camera. During a brief hands-on with a prototype of the KEYone, this reporter found the keys to be small and crammed together tightly at the bottom of the device, making it difficult to type on. But Cistulli said the physical keys were exhaustively tested by existing BlackBerry users who are accustomed to typing on physical smartphone keys. "We tested the keys thoroughly for their size, with tests worldwide," he said. "It would take you one day to get used to it." Russ Ernst, vice president of product management for Blancco Technology Group, said consumers have been trained for a decade on how to use a touchscreen phone. TCL and BlackBerry "will need to figure out how to overcome the training gap for those who are not used to a physical keyboard," he said. Blancco makes data erasure and mobile diagnostics software. Ernst said the customizable physical keys are one of KeyONE's most innovative features. "It will be interesting to see if [they] will be enough to draw users back to the physical keyboard," he said. On the other hand, it remains to be seen if users will adapt easily to the DTEK feature. It's been "difficult" for mobile security to gain mass adoption, Ernst said. For instance, although Samsung's Knox security is widely installed, "is it really used?" he asked. Ernst said the claim that the KeyONE is the most secure Android phone is not quite accurate, since the office of the U.S. president uses the Boeing Black Android phone. Overall, TCL has a "difficult road ahead to get to 8% market share," Ernst added. "TCL will have to unseat some difficult challengers in Xiaomi, Oppo and Huawei, not to mention if they intend to steal market share from Apple and Samsung," Ernst said. "If TCL can leverage the BlackBerry brand to capture share outside of China, they may have a chance." Even with the hardware and software features of the new KEYone and all the security claims behind it, TCL's Cistulli conceded that the biggest challenge will be marketing the device in a crowded and competitive smartphone market. "Marketing is the next challenge," he said. "We'll take it that we walk before we run." This story, "Back to the future: BlackBerry KEYone launches with physical keyboard" was originally published by Computerworld.